Unusual shrub 6'x 6' with large lemon-mauve flowers most of the year. Adaptable to wide range of soil types and conditions - coastal or inland. Frost and drought tolerant once established. Suitable for low windbreak. Used also for erosion control in Australia. The very large flower heads 10" x6" diameter, are used in floral displays and often "portrayed" as animals. 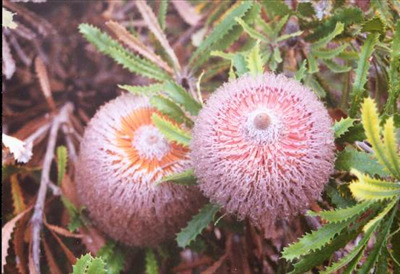 An unusual banksia for any garden.